Wella's most advanced colour care for long-lasting and healthy-looking colour with Microlight Crystal Complex. With new Microlight Crystal Complex Technology, specially designed to enhance the brilliance of W..
Light and high conditioning levels available. Both formulas moisturise coloured hair, leaving fin..
Pump designed to fit all Wella Professional 1L Bottles. 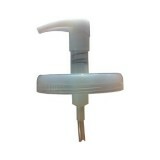 (Will not fit Wella SP) ..
Pump designed to fit all Wella Professional 500ml treatment tubs ..